The Land of Departure is a world in Kingdom Hearts Birth by Sleep. It is the original "hub" world of Kingdom Hearts Birth by Sleep. The Land of Departure is one of few special worlds in the Kingdom Hearts universe that is located between the Realm of Light and the Realm of Darkness. As such, Master Eraqus described the world as a neutral place where light and darkness exist in balance. The Land of Departure has physical qualities of several major worlds from the Kingdom Hearts series. The Land of Departure is shown in artwork to be set high in grassy mountains, surrounded by flowing water. The building itself decreases in width as it reaches the ground, tall spires protruding from the roof. Two lengths of golden chain connect the castle to twin peaks. Similarly to Twilight Town, there is one major building in this world's render; the main building also bears a resemblance to Twilight Town's clock tower. Like Radiant Garden, this world also has a circular area in the middle of it, with a large building overhead. 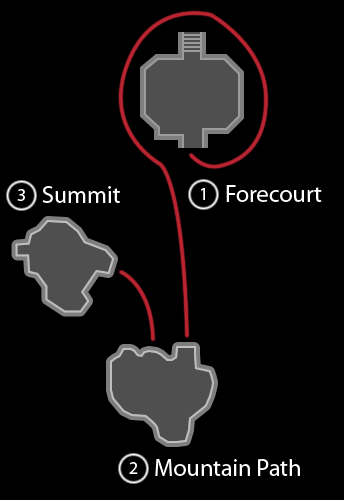 The game's tutorial, while still controlling Ventus, takes place in the Mountain Path (山道, Sandou?). Going up into the hill leads to the Summit (山頂, Sanchou?). The area before the Mountain Trail is the Forecourt (前庭, Zentei? ), where the world's Moogle Shop can be found if the player chooses to return to the Land of Departure for a limited time in the story. Beyond is Terra's, Ventus's, Aqua's and Master Eraqus's home. The Land of Departure is also one of a select few worlds in the series that features areas that eventually cannot be accessed during later portions of the game. After Master Eraqus is killed and Master Xehanort plunges the world into darkness, the world cannot be fully revisited. The Forecourt is no longer accessible because the road leading to it has collapsed, and it is seen one last time towards the beginning of the Final Episode. Generations of Keyblade Masters have kept the land safe. Years before the events of Birth by Sleep, after being made Keyblade Master, Eraqus became the steward of the Land of Departure while his fellow apprentice, Xehanort, became a Seeker to learn more of the worlds. By the time the two crossed paths again, they entered into a discussion where Xehanort revealed his intent to create a second Keyblade War that resulted with the two having a major falling out with Xehanort scarring Eraqus. Years after that event, after creating Vanitas from the youth who somehow survived the process, Xehanort decided to take advantage by leaving the amnesic Ventus in Eraqus's care to be trained by him alongside Terra and Aqua. On the day before Terra and Aqua undergo the Mark of Mastery, they momentarily spar with Ventus before Aqua gives her fellow apprentices Wayfinders so the three of them would never be truly apart. The next day, arriving to see the exam proceedings, Xehanort rigs the test with orbs of light attacking the three Keyblade users. Despite the interference, Eraqus allowed the test to resume and names Aqua master while Terra is dismayed that he remains an apprentice. As Eraqus takes Aqua to inform her on the duties she is to take, Xehanort and Vanitas respectively manipulate Terra and Ventus into leaving the Land of Departure. As Ventus chases after Terra, Aqua is sent by Eraqus to retrieve the former. The Land of Departure is shrouded in darkness. Later, after an encounter with Xehanort presents a startling revelation, Ventus returns to the Land of Departure to confront Eraqus of his past. However, seeing that Xehanort is still acting on the scheme he unveiled to him ages ago, Eraqus resolves to kill Ventus for the good of the worlds. However, Xehanort arranged Terra to arrive to stop his master and makes his move to kill his former friend. 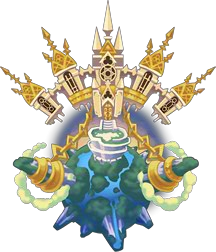 From there, Xehanort then blasts an orb of darkness into the sky that causing the Land of Departure to become shrouded in darkness while sucking in most of the castle. Shortly before meeting at the Keyblade Graveyard, Terra, Ventus, and Aqua each separately return to their ruined home and encounter a time-traveling Young Xehanort, who attacks each of them in turn. He vanishes after his defeat, continuing onward to the future to carry out his tasks. The Land of Departure's Keyhole. After Ventus loses his heart and falls into a comatose state in the aftermath of the events at the Keyblade Graveyard, Aqua returns to the destroyed castle with Ventus on her back. She places Ventus in the middle throne and, using Eraqus's Keyblade, seals the Keyhole and reconfigures the Land of Departure into Castle Oblivion to both protect the land from any who would take advantage of it and keep Ventus safe in the Chamber of Waking. Immediately after saving Aqua, Sora, Donald, and Goofy travel with her to Castle Oblivion, where she utilizes the power of the Master's Defender to restore the Land of Departure to its former glory. Aqua leads the group to Ventus, where she apologizes to him for making him wait so long and tries to wake him from his slumber, only to be disappointed to learn that his heart never returned in her absence. Just then, Vanitas makes his presence known, having followed the group in order to find Ventus. Aqua attacks Vanitas when he approaches Ventus, and despite Sora, Donald, and Goofy wanting to help her, Aqua refuses and casts barrier to isolate herself and Vanitas in order to redeem herself. When Aqua gains the upper hand, Vanitas instead targets Ventus, attempting to shatter the barrier. Seeing the danger, Aqua throws herself between Ventus and Vanitas, taking the brunt of Vanitas's attack. With Aqua weakened, Vanitas moves in to claim her heart, but this action stirs Ventus's heart within Sora. With Sora's help, Ventus's heart returns to his body, allowing Ventus to wake, break through the barrier and clash with Vanitas. Vanitas retreats as Sora, Donald, and Goofy join Ventus and Aqua, though he anticipates another encounter with Ventus. Afterwards, Ventus notices that Vanitas and Sora look alike, leading Ventus to realize that Sora was his second chance. Following the clash with the thirteen seekers of darkness, Aqua, Ventus, and Terra return to the Land of Departure and organize a grave dedicated to Eraqus, using the Master's Defender and their three Wayfinders. As they leave, Ventus notices his Chirithy watching him and welcomes Chirithy back to his side with open arms. Although he does not make an appearance, Eraqus and Xehanort's master is mentioned on several occasions. It is known that he was a Keyblade Master who taught the two when they were only apprentices. In Ventus's room, two of the books on his bookshelves are titled Birth by sleep and Ultimania. In the original Japanese release of Kingdom Hearts Birth by Sleep, Land of Departure disappears from the world map after its destruction in each character's story, making it inaccessible in that character's save file from then on. Due to this oversight, it becomes impossible for the player to complete the Journal (and by extension the Trinity Archives) if they had not opened the Treasure Chests in that world beforehand. This was rectified in all subsequent versions, where a ruined version of the world could still be accessed after this event, which also serves as the location for the Unknown boss battle. ↑ 1.0 1.1 Kingdom Hearts Birth by Sleep Ultimania "[Land of Departure] It is a special place between the realms of darkness and light, and has been protected for generations so that it is not used for evil. A device was set in place just in case of such an event, and after Master Eraqus was killed and Aqua closed the Keyhole of the world, it put this device in action. It turned it into a castle which would draw anyone who goes there into oblivion." This page was last edited on 15 April 2019, at 17:40.